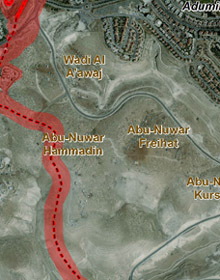 The Abu Nuwar locality is located southwest of Ma’ale Adumim, west of the access road to the Qedar settlement. Members of the community originally hailed from the Tel Arad area, and settled in this area in the mid-1960s. When they reached the area, they settled on private lands owned by residents of Abu Dis, under the agreement of the landowners, but today, in the eyes of the authorities, most of the locality’s lands are declared state lands, while the status of others has not yet been determined. The locality is included within the jurisdictional area of the Ma’ale Adumim settlement and within the limits of the E1 expansion plan for Ma’ale Adumim. The separation barrier is planned to pass near the locality on the western side, and seizure orders for land along the route were issued in 2005. 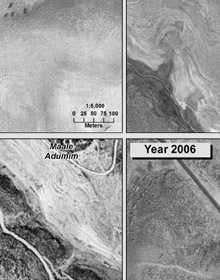 The locality comprises three-four main clusters, and historical analysis reveals continuous 0building there since at least 1970, when there was a significant increase in the population in the 1990s, apparently following the evacuation of Bedouin settlements in the areas of Ma’ale Adumim’s expansion. During 1997 and 1998, and again in 2005, demolition orders were issued for every structure in the locality, and although none were carried out, residents were prohibited from erecting any new structure or building additions to existing houses, all of which were constructed of wood, tin, and plastic sheeting. Residents of Abu Nuwar own a total of approximately 3,000 heads of sheep and goats, which they take out to pasture in the wadi beneath the waste burial site and in the Qedar area, but these grazing areas have been reduced substantially due to the many closed military areas in the region. Due to the ongoing pressure on grazing, they have reduced their flock holdings; in addition, the Palestinian Authority’s veterinary service is only partial and insufficient. The residents manufacture milk products for sale and barter, but while in the past they sold them in Jerusalem where the profits were higher, today they can only distribute them via public transportation and private vehicles to Abu Dis and Al-E’izariya, reducing the earnings. They have been prohibited from developing agriculture, and in any case, the land is rocky and difficult to tend. In the past, some of the residents worked in construction in the settlements and in the surrounding villages, but today, the army authorities no longer grant permits, and unemployment is as high as 80%. The women do not earn any outside income. A small preschool operates in Abu Nuwar, attended by some 20 boys and girls. The teachers live in the cluster where the pre-school is located. Several demolition orders have already been issued for the preschool. 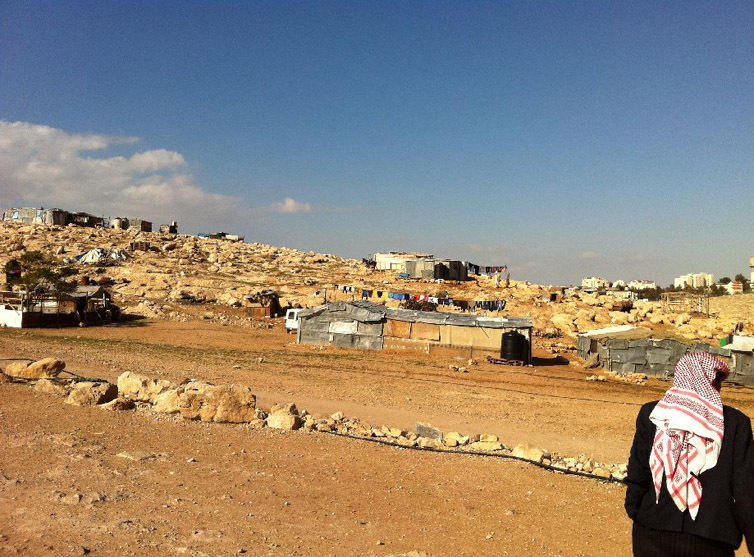 Some of the elementary school children attend school in Wadi Abu Hindi (approximately 20 pupils), necessitating a difficult trek on foot, while others attend school in Al-Jabal (approximately 50 pupils). The middle school serving Al-Nuwar is located in Al-Jabal (some 20 pupils) and high school students must commute to Al-E’izariya (some 10 pupils). Recently, a new road was paved for the settlement of Qedar, with metal security rails erected on both sides, making it extremely difficult to cross; pupils walking to school in Wadi Abu Hindi, as well as residents taking their flocks to pasture, are forced to take a large detour to the south, avoiding the fence through a passageway beneath the road, where storm runoff sometimes poses a danger in winter. The waste burial site is extremely close by and presents hazards for the residents. It emanates a foul odor, mainly during the night, and causes respiratory problems. In addition, the area of the Al-Jabal neighborhood is unsafe, and according to residents’ claims, there have been cases of gases escaping on the grounds of some of the homes (for example, when vegetation is being planted or digging takes place for other reasons).